This project aims to foster networks between the participating institutions in the UK such as SISJAC, SOAS, University of York or others and Nabunken (Nara National Research Institute for Cultural Properties, hereafter) in Japan, and to establish collaborative research pathways that can be developed into larger scale research projects through a series of seminars. The individual lectures in this seminar series are framed by broader methodological and theoretical questions that offer further development of inter-regional and cross-disciplinary research topics and questions. –What is the international significance of archaeological and cultural property research in Japan? –How has NBK-led research impacted current understandings of Japan’s past? –What specific research questions can we address for international collaborative research? Nara National Research Institute for Cultural Properties, is an organization committed to comprehensive research on ancient cultural heritage. The ancient city of Nara is known for its wealth of ancient architecture and historical works of art, and the Institute was established to conduct research on these materials. Inspired in the mid-1950s, by the problem of preserving the Nara palace site, to get involved in research on buried cultural properties as well, the Institute has achieved significant results in the excavation and study of the Nara and Fujiwara palace site. These have contributed to international academic exchanges aimed at shedding light on the development of ancient capitals. In addition, sophisticated techniques of restoration, developed at the Institute for preserving valuable buried cultural materials, have been applied in the preservation of sites and artefacts throughout the world. Futhermore, the Institute also serves as a centre for the training of, and for conducting joint research with, both local government employees involved in archaeological excavations, and foreign researchers. The seminar is free to attend and no registration is required. However, the organiser would appreciate participantion ahead of the day. In Japan, plant oil began to be used widely from the seventh century AD, when new bureaucratic systems based in Nara were being established. This talk discusses the adoption and spread of various kinds of plant oil based on written records and excavated artifacts with clear contexts. It is relatively easy to recognise pottery vessels that were used as oil lamps, since the use of oil tends to leave clear traces. Building on this, I will introduce examples of these lamps and suggest possible further approaches for shedding light on ancient plant oil use in Japan. Objective: Establishing a global scale comparison of ceramic and glass studies. This research aims to reveal the distribution routes of raw materials and spread of production techniques of lead glazed ceramics and lead glasses in Japan, using analytical scientific methods. The innovation of lead glass (include lead-barium glass) in Japan is dated to around the 3rd century BC and 7th century AD, and the potassium lead glass emerged around the 10th century AD to around the 12th century AD. Over this period they showed significant changes both in form and glaze color. I investigated the variation of the raw materials and the production techniques, and tried to estimate from where the influence was brought. My research is based on the study of sherds using scientific analysis of their chemical composition and the character of glaze and clay, the estimated firing temperature and the lead isotope ratio of glaze. The analysis has been conducted on fragments that belonged to the four categories. 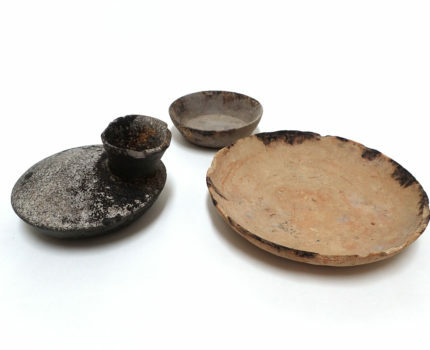 (1) the shards excavated from the production sites in the initial stage of the domestic production, (2) the shards excavated from the sites of consumption, (3) the shards of the Tang tricolored earthenware excavated from the kiln sites and (4) the shards excavated from the Bohai region in China. The results suggested that early lead-glazed ceramics in the 7th century received influenced from the Korean Peninsula. In the case of domestic production, the source of lead ore was not limited to one place. Previously, it is assumed that the ceramic production was dominated by one workshop which was possibly managed by the government, using the lead raw materials from the one production place. However, the results of the analysis indicates that raw materials were supplied from other production places as well, suggesting that the production system was not totally monopolized by the government for relatively short time period. Japan has historically treasured high quality ceramics from China and Korea. Japan’s passion for imported ceramics continued during the Edo period although the quality of domestically produced ceramics had improved to the level of the imported ceramics. A high demand for imported ceramics was generated by the extreme restriction on trade and communications with overseas at that time. Towards the end of the Edo period, a vast amount of low quality Chinese and European ceramics were imported in response to an increasing fascination with the outside world. This fact, however, has not attracted much academic attention in the past. This seminar will discuss the rise of nationalism in late nineteenth century Japan and its effect on the development of ceramic history to date. In Japan, the number of ancient wooden architecture built before 12th century is about 60 and large number of historical documents with information of architecture still exist today. Due to this fortunate situation, Japanese architectural history was based on these historical buildings and documents. On the other hand, archaeological excavations also have revealed other aspects of buildings in the past. For example, almost all existing historical buildings have foundation made of stones structure, but excavated remains show that in ancient age, almost all buildings were earthfast post structure. Furthermore, the unearthed building components show unique construction method which cannot be observed in existing buildings which is believe to originated from the ancient age. In addition, the number of existing buildings in Nara Period is very few and it hardly change, in contrast with that the number of archaeological building structures are growing day by day as a result of excavations. Therefore archeological information is getting increasingly important. However, it is difficult to treat remains as architectural feature, because it needs archeological and architectural knowledge to comprehend remains. In this talk I will introduce Japanese way of interpretation which connects archaeological remains with buildings, as well as emerging new aspects of Japanese architectural history.